On an extremely steep site, with poor pedestrian access - 70 steps down from street level - this house nestles in its own micro climate. It’s almost a tropical rainforest with dense, mature vegetation including palms, thick lush undergrowth and large angophoras. The back of the property faces west to low bushland slopes. At the rear of the house an existing in-ground concrete pool, with a roped wrap-around timber deck, dominated the area. Also in place was a 3.3 metre high paling fence, painted purple with peppermint colour larch inlays and a two storey blank house wall opposite. The interior of the house had recently been upgraded and the client now needed an outside style to match. The married couple with two teenage girls and a much loved large dog wanted an outdoor space where they could relax in total privacy with poolside sun beds, large umbrellas, cushioned daybeds, retractable shading options, outdoor music and a drinks fridge. The most significant design modification was centred around the existing in-ground concrete swimming pool. The first, and one of the most striking design decisions, was to replace the timber decking surrounding the pool, with natural turf. This instantly transformed the space from a pool and deck, into a garden with a pool. The pool was resurfaced in vibrant blue mosaic tiles adding an injection of vibrant colour complemented with large format bluestone edging with linking bullnose tiles. The design focus shifted to the pergola. The design of the new pergola had to fit into the awkward angular shape of the rear of the home as well as link the inside split floor level with the pool. Under the raked roof and ceiling a tallow wood timber walkway with frameless glass balustrade was included. The turndown of the walkway incorporated tallow wood sliding doors for easy access to the ample weatherproof storage beneath, including audio-visual equipment and a drinks fridge. The turndown also cantilevers out as a deep, floating daybed with custom-made cushions, with retractable stripped awning over. The ‘something different’ brief from the client was the biggest design challenge on this project. The landscape designers were presented with two amazing blank canvases: a 3.3 metre high x 14 metre long boundary privacy screen and an almost blank, two storey external wall. Their concept design developed into two intertwining screens which float in front of the walls, with plants cascading through the screens, with hidden irrigation, drainage and lighting. Working closely with an engineer, who thought the landscapers ‘were mad’ they eventually worked out how to create the skeletal frame. This idea was repeated on both walls. To define the architecture, the foremost front section of the house was painted in Resene Vibe, an intense burst of colour to welcome and to contrast with its cool and muted surroundings. The remaining house was repainted with Resene Lumbersider in Resene Quarter Dune to complement the existing powder-coated colour of the metal doors and window frames which could not be altered. All new doors, frames and external ceilings were painted in Resene Quarter Caraway. The simple colour palette of various strengths of Resene Triple Dune was also ideal to highlight the intertwining screens while contrasting, but not fighting, with the architectural detailing. 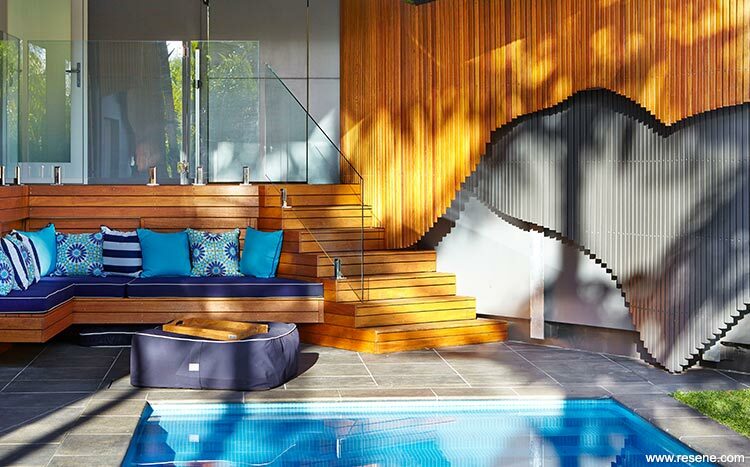 The new colour palette also complemented the shading of various timber species, the bluestone tiling and bright blue mosaic pool tiles. Full strength Resene Triple Dune provided the depth of colour required to cover over the original woodwork – previously painted a dark forest green. 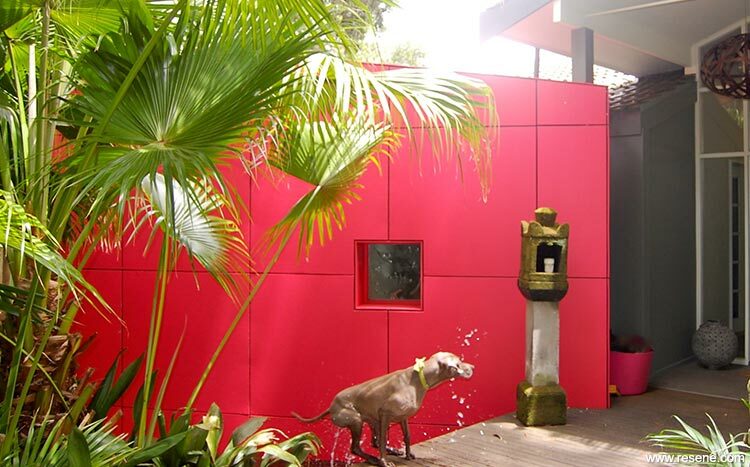 It also worked well with the new powder-coated metal trims finished in COLORBOND® Monument.